Set in an idyllic landscape, NAFEA faaipoipo (When Will You Marry?) explores the psychology of the Tahitians as Gauguin saw them. The Maori title is a provocation, suggesting an emotional situation heightened by the poses of the women, their contrast in dress, and their expressions. The sensual female in a colorful, wraparound skirt (pareu) crouches, turning away from a more reserved woman, who sits upright, wears a missionary-style dress, and points beyond the picture plane. Her gesture may derive from Buddhist art and indicate a warning or a threat. The flower in the hair of the foreground figure suggests her interest in a husband or a lover, while the second figure has been interpreted as an alter ego of the first. Gauguin’s young companion Tehamana (Tehura) may have modeled for both—one the Tahitian woman of his dreams, the other his reality. The color and design of the painting represents a synthesis of experiments. A preliminary drawing exists, as does a full-scale pastel of the crouching woman, which he transferred to the canvas. The picture’s matte surface may be the effects of l’essence when oil is drained from paint and then mixed with turpentine. The related work Tahitian Women shows a less idealized rendering of the two figures. The woman wearing the pareu is featured again in Eu haere ia oe (Where Are You Going). NAFEA faaipoipo was included in Gauguin’s Paris exhibition of 1893 at Galerie Durand-Ruel, listed for the extraordinary price of 1,500 francs. 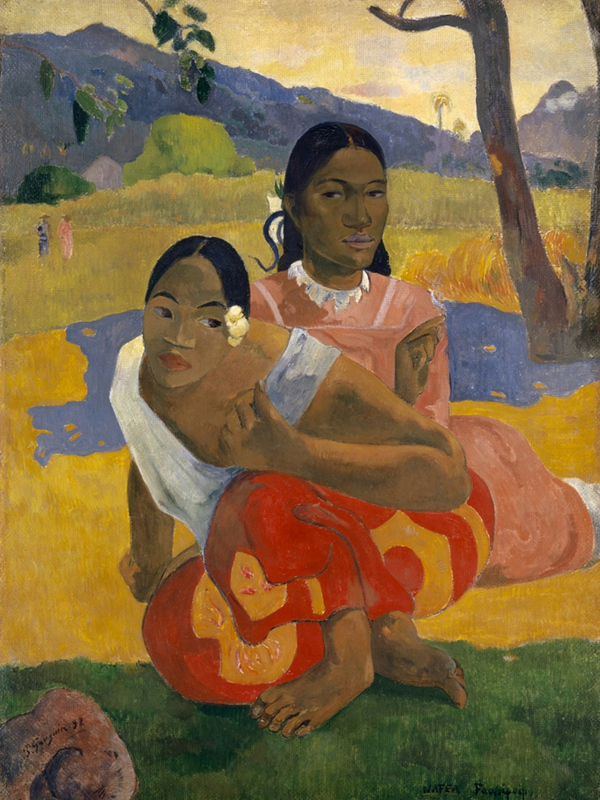 Gauguin held it in high regard and believed it would appeal to a Parisian audience, perhaps swayed by Western perceptions of Tahitian women popularized in novels by Pierre Loti and others. Unfortunately, it did not sell. Elizabeth C. Childs, Etta and Mark Steinberg Professor of Art History at Washington University in St. Louis, examines this work in the context of Gauguin’s prolific engagement with both the mythic idea and the social reality of the Tahitian vahine (young women) of colonial Tahiti in a lecture Thursday evening, Dec. 10. 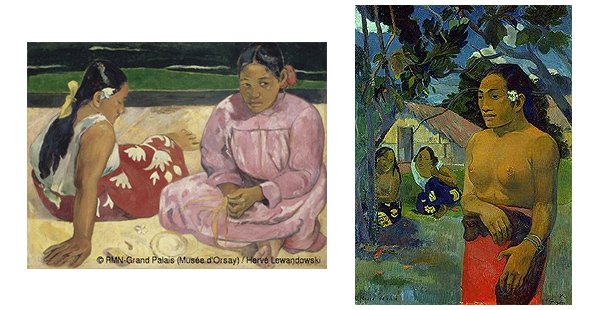 This entry was posted in Exhibitions and tagged artist correspondence, exoticism, Paul Gauguin, tahiti, tahitian, two tahitian women, two women. Bookmark the permalink.